Hello! Guys I have studied all weekend. 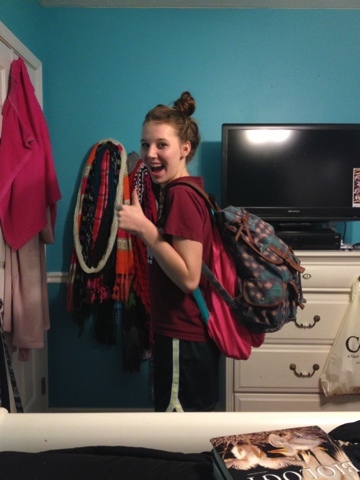 I had so much work I needed 2 backpacks to hold it all! No guys that's a joke..but you like my backpacks? The top ones from UrbanOutfitters and the bottom pink one is from American Apparel! OH speaking of my room, I now have new carpet and painted walls. I need some decor and to redo my closet and then I'll be able to give y'all that promised room tour! It may be awhile but I have not forgotten about it! And guys! Help! I cannot find a comforter set!! Like I kind of want a plainish one to where I can throw a whole bunch of random pillows from Urban Outfitters on it to make it look cool..and if I wanted to change up the room style it wouldn't be an issue... I'm not sure tho..it needs to look ok with a light pink room in a full size bed size..Hmm. If you stumble upon any cute ones tweet me the link at @katiefriedmann or comment the link below or email me the link from the envelope icon on my sidebar to the right of this post. Yeah. That'd be nice! Well everyone, it's late (not really, but I have a huge test first thing tomorrow) so goodnight! Love you all!